Tomorrow is December 1st … time is just flying by! I still have leftover cranberry sauce from Thanksgiving in the fridge! I have a few supplies to give away to one lucky baker !!! Silicone spatula … you can never have too many! Decorating tip #1M … makes frosting cupcakes a breeze! 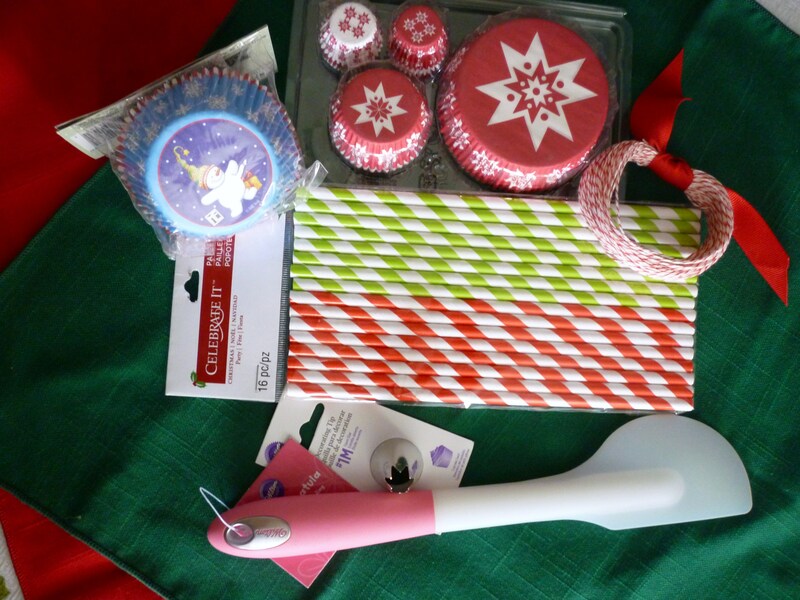 Stripped straws … for crafts or drinking you favorite holiday beverage! Bakers’ twine … to tie up your baked goods! Snowman cupcake papers … because everyone loves snowmen! Variety pack of paper cups … because you never know what size you need! To enter this giveaway simply tell all of us … what are you planning to bake for the holidays … leave your answer as a comment (click at the top of the page) . Only one entry per person. You must leave your comment before 11:59pm (pacific time) Sunday, December 2, 2012. Winner will be selected at Random and announced on Monday, December 3. The winner must contact me by Wednesday or another winner will be drawn. Brenda, today I baked Seval’s Sesame Seed Cookies (which I’ll have on my blog soon) for a holiday bake sale. I’ll be making more for gifts, plus plan to bake Peanut Butter Blossoms and Candy Cane Cookies to give away, too. Thanks for this fun giveaway! Hang in there. I have a feeling you’ll win the battle with the computer. Or, maybe Santa will bring you a new one for Christmas! Of course I’m baking for Christmas. I will be making some treats for our close friends (either cinnamon almonds or chocolate covered peanut butter balls, or something else!). And of course, I will have to bake a couple of pies for Christmas dinner (pumpkin, what else, and probably peach). Mmmmm … I can just about smell those pies already. LOL. My first holiday project is a chocolate cake, which i am making tomorrow for a work party! I am going to make chocolate covered marshmallows for work, dip them in peppermint. I am also making a peppermint cheese cake, make a small one to test out, and then I am working on finding a white chocolate alcoholic drink. This I want to make ribs for Christmas dinner. I usually do chocolate covered pretzels to give away at my other job :3 but we’re see! I am excited for the cheese cake. My mother is visiting next week and we’ll be making pineapple filled cookies. A tradition handed down from her mom, my grandmother. I will enlist the help of my husband and son & daughter to make and bake Grandma Dorothy’s Anise Cut-Out Cookies;it is my husband’s Grandmother’s recipe that he remembers her baking at Christmas time. I make the dough, my husband rolls & cuts with cookie cutters and my teen son & tween daughter decorate/paint them before they bake in the oven. We make cookie platters and pass them out to the greeter at Walmart, the trash & recycle collection guys, gas station attendants, our pastor’s 87 year-old Dad who loves them and refuses to share them with any one. It is our cookie ministry for the holiday season! I started today. Made oatmeal raisin cookies. Had part of a bag of butterscotch chips and part of a bag of Heath bits I threw in. They have been a big hit tonight with my scrapbooking group. Have been pinning new cookie and candy recipes on Pinterest to try this year. Both of my girls will be making their Grandma’s English toffee. that looks awesome! I am going to bake some things I have pinned on my Christmas pinterest board…should get interesting! HA! I have a sourdough starter I started 23 years ago, and makes the best sweet dough…I use it to bake cinnamon rolls, kolaches, and a candy cane shaped braid filled with cream cheese. I will bake all sorts of cookies but my favorite is Goo Goos. I love baking for family and friends! i am going to bake a lot of cookies and molten lava cake. lovely giveaway. hpoe to win. I’ll be baking tons and tons of iced sugar cookies! Thanks for the great giveaway! One thing for sure that I will be baking is peanut blossoms! Then thumb print cookies and probably italian cookies as well. Also will be trying out some new recipes too. Plan on making Peppernuts(German cookie), decorated sugar cookies of all sorts,Christmas Jewels, Chocolate Cherry Kris Kringles, along with other varities and that’s not counting, the variety fudge I make and then there’s my no-bake cookies, tarts, etc. I am going to be baking with my Granddaughter, Jessica, we will be making cookies, cupcakes and a Christmas Tree Cake. She loves to bake and this gives us some real time together. What will i be making and/or baking for Christmas…candy and cookies, fudge. there’s always sugar cookies and another cookie my mother gave me the recipe to. Crescent cookies, these cookie are delish…. i love being in the kitchen @ Christmas time except when it comes to dinner. lol Merry Christmas to everyone! cookies will come first when i thought of baking, and for this christmas i am planning to make molten lava cake. I’ll be baking red velvet cupcakes an my hubby a birthday cake. I will be baking christmas cookies with my family. It’s a tradition I look forward to. For the holidays I am baking Christmas sugar cookies, gingerbread men, peach cobbler, lemon cake & homemade bread. Peppermint brownies, banana cake, gingersnap cookies, brandysnaps. What are you baking? I will be baking a cannoli cheesecake. Divinity … Pray that it turns out great like mom always made this time of the year!